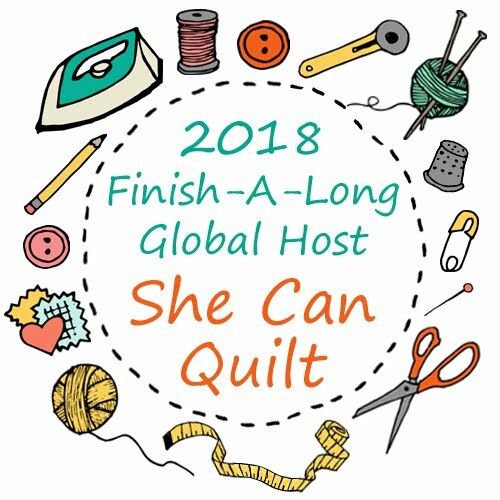 she can quilt: Mod Pop QAL - let's get this show on the road! 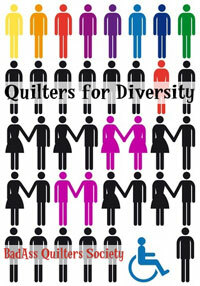 Some of you have already told me you will quilt along with me while I make another bigger Mod Pop and anyone else who might want to is welcome to join in too. Let's get started on the QAL. We are going to move at a leisurely pace for the QAL, but those of you who want to push ahead are most welcome to do so. Over the next couple of months I will share some thoughts and ideas on picking fabrics, cutting and arranging the fabrics, sewing the curves, and quilting. I hope others will also chime in with their insights as we go. Hopefully we will be finishing up in time for the holidays as I know some of you might want to give your quilt as a present to someone and what a great present it would be. Look at it in prints, that is Julie's version. The first step for the QAL is to buy the pattern and we get to start with a giveaway from Julie, Distant Pickles, who designed it. Julie and her husband have put together a template set for cutting these blocks, and included in it is a paper copy of the pattern. To win that, just leave me a comment - one per person please. I will draw the winner next Friday night. By the way, you don't have to commit to the QAL to enter to win. To read about Julie's newest Mod Pop go here, to buy the pattern and/or the templates go here. By the way, the templates are not required to make the quilt, a nice to have and I love using them, but they are entirely optional. And there are other prizes too! I will tell you about the other wonderful sponsors I have lined up shortly. We have some discounts on fabric purchases and some bundles of fabric for prizes as we go along. 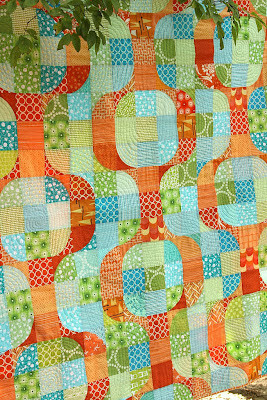 So if you are thinking of quilting along with me, grab the button (which I made myself using Lynne from Lily's Quilts excellent tutorial), feel free to invite your friends and spread the news, and join the flickr group which is here. I am back in the city and have a very busy patch at my work, in fact it is a weekend of work and little sewing. But it is a lovely day and a long weekend too, so enjoy! Just when I said I wasn't joining anything right now, how can I not? The quilt is so Fabulous! Love this Quilt, it looks so wonderful! Especially since I was lucky enough to win the pattern. I'm am so chuffed I found your QAL. I like this pattern and I love Julie's version! I have way too much on my plate, but I can't resist. Count me in! i love both of your color choices. I am so being tempted by this quilt along...I will let you know if I can be added to your qal buddies, lol. Thanks so much for sharing! I don't have much experience with curves or templates so this would be a great learning experience. And the quilt is so gorgeous! Love the quilt, from the first time I saw it, and would love to make one! And it sure looks great both with prints and in solids! I'll have to decide what to choose... Thanks for this great giveaway!!! Oooh I am super tempted by this QAL, I have been in love with this design every time I see it pop up on Flickr! I am tempted by this one too. I think the templates are the same as the retro flowers, right? I might join because your versions is so lovely. The first second I saw Mod Pop I thought it was fabulous! Love the orange and aqua. Thank you for that great video on sewing curves. I have been hesitant to try them but I think I will try it out. I have a few other projects ahead of this one but I will see if I can get busy and catch up! I am ready to go! Except I still need the pattern - maybe I'll be lucky! I would love to join in but am not sure I have the time. The pattern is fabulous though so I have bookmarked it in the hope of making it at a later stage. Lovely giveaway! I suppose if I should win I might just decide to join the QAL after all. I have some Terrain that I would like to incorporate. Yay! So excited to try this. I love the blue/green! I'm drooling over this quilt, Leanne! Maybe another QAL is in my future after all! Thanks for a great giveaway. I love the way the various fabrics make it look so different! Life is terribly busy for me right now, but I can't resist this QAL. I'm in! Thanks! Fabulous colours...would make a great stuff for a baby girl nursery room! Oh great...geez Leanne how can I not? This quilt is so cool, can't wait for your tips. Love the colors in the blue/green quilt - gorgeous!! This looks like a fun quilt to make. Verrry tempted to join in but must resist for now. Would love those templates for a future quilt! I'm in love... The colour, so modern, the everything.. I'm dazed... I hope to win? If not, Ill be buying the pattern. I love the pattern and want to make it! Maybe I will find a way to swing it. You are right it would make a beautiful present. Hum! Going to have to think on this one. Thank you for the lovely giveaway! I of course would love to win! I love this pattern and I'm so glad you're doing a quilt-along. I just purchased the set so I'm set to go whether I win or not. Thanks for hosting a great giveaway! I really love this pattern! I am in for sure! Thanks for this giveaway! I'd love to give this pattern a try. I love this pattern & the QAL sounds great. Thanks for the chance to win! So tempting Leanne, I joined the flickr group. I just joined in another quilt-along but I think the fabrics I had in mind for that one will look so much better in this quilt... decisions, decisions! Thanks for a chance to win the give-away! Great pattern. I think mine would have to be done with some Kona solids. Thanks for the chance to win! Seeing the two colourways is super. I will certainly join in the QAL - my first! Thanks for a chance to win this give away. I have already bought the pattern, but the templates would be handy! I have some fabrics in mind, and I'm keen to get going! I would love to joinin but I have so little free te at the minute I have to be realistic. I will add it to my to do lust though as I think this is a great pattern. Enjoy your long weekend. Hope it is not all work and no play! I'm more and more tempted, although I'm not yet sure if I'll be able to squeeze it in. Oh boy - I do love this pattern, I just don't love going back to work and having 6 squillion other things on my plate already! Looks like you are going to have a crowd Leanne! I have the pattern but the templates sound good. I've never done a quilt-a-long but I adore this pattern, especially the solids version. Count me in. I have this quilt bookmarked, the pattern and the templates would really get me started!! Thanks for the chance. What a fantastic giveaway! Love this modern design! What a fun design:) have fun for the QAL! This will be my first QAL. Thank you for the chance to participate. I am also in love with the color combinations I've seen so far. I can't wait to get started. What a beautiful pattern. I love it in both the solids and patterns. This is going to have to go on my list to make. I'm in for the QAL, of course! 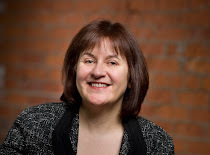 I'd love to win Julie's templates too - that would be just super! Thanks, Miss Julie! Oh, I love this quilt pattern and would love to win a copy! I'll throw my name in the hat! 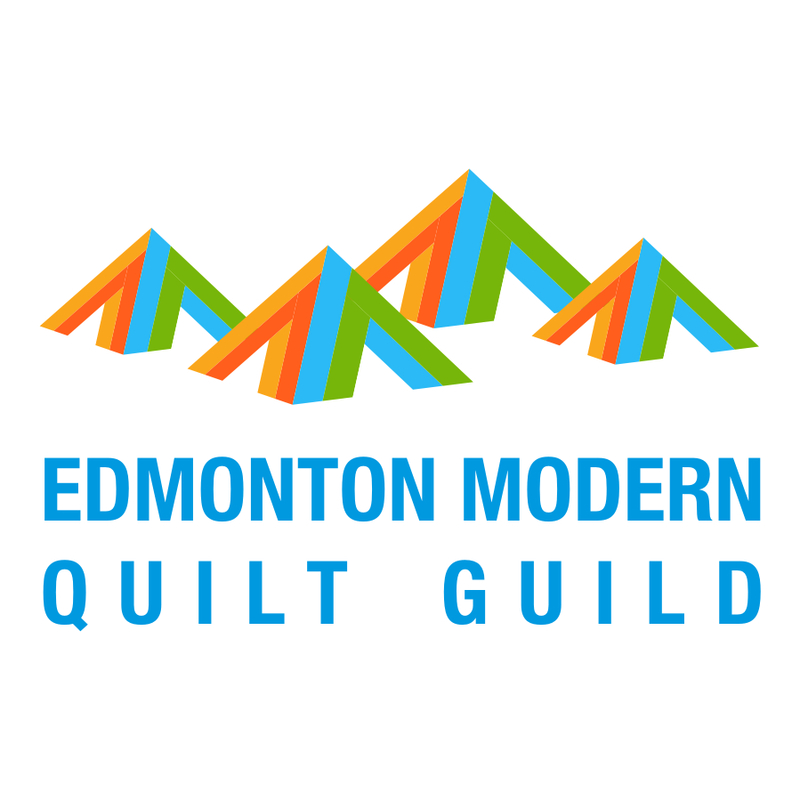 I won't be joining the QAL, but can't wait to follow along and see all the gorgeous quilts created! I love this quilt and the fabrics. It's beautiful!! The second I saw this quilt, I knew I needed to make it. And now there's a QAL? Count me in!! This is so fantastic. I can't wait to try this. I just love this quilt - I prefer it in the solids, I think...but it's beautiful either way. That is one cool looking quilt! I would love the pattern and to make the quilt. Oh if we could have more hours in the day for crafting. So exciting - hope I can squeeze this in!!! Will hopefully be joining in with you, and with mum too! HI! I was a pattern tester for Gypsy dance, i love Mod pop also but was scared about the curves...now though I want to try it to make for my sister for christmas, I think she would truly love it! I am in on the QAL and would love to enter the giveaway! I was just led to your blog post from Pinterest, and this quilt is awesome! I had never seen it before. It totally reminds me of the mid-century room divider screens that were so popular then. You can see them in play on Mad Men. Once I saw it, I knew I had to make it, and I have just the fabrics in mind. Thanks! Love this quilt ... thanks for the giveaway. I love that pattern! The curves scare me a little, but a little bit of fear hasn't stopped me before. Thanks for the chance at the giveaway! I love the look of this quilt! I love how organic the shapes in this quilt are! This is my first QAL and my first time using flicker. I ordered the pattern pdf. Do I just start and start posting photos or do I wait for some sort of "general group email or post"? Thanks for the clarification.